Coconuts come from the coconut tree, which is a member of the palm tree family and the only living genus of Cocos. The term "coconut" can refer to the whole coconut palm or the fruit or seed, which botanically is a drupe, not a nut. The term is derived from the 16th-century Portuguese and Spanish word coco meaning "head" or "skull" after the three indentations on the coconut shell that resemble facial features. Because this "nut" has so many different aspects and health benefits, I will go over each one individually. Starting with the "meat" or the "flesh" of the coconut, which is on the inside of the shell. This inner flesh is a regular part of the diets of many people in the tropics and subtropics. Coconuts are distinct from other fruits because their endosperm contains a large quantity of clear liquid called "coconut milk." When immature, it may also be harvested as "coconut water" or "coconut juice," which I will break down more later. The endosperm is initially in its nuclear phase suspended within the coconut water. As development continues, cellular layers of endosperm deposit along the walls of the coconut, becoming the edible coconut "flesh". This edible coconut flesh is pack full of goodness! One cup of raw coconut has 7.2g of fiber, 52% DV of manganese, 14% DV potassium, 40% DV of folate and 37% DV copper. While it may not be a complete source of protein, it’s still packed with amino acids. Containing 17 amino acids out of the 20 amino acids needed for optimal protein formation. It’s particularly high in threonine, an amino acid needed to protect the liver, central nervous system, cardiovascular system, and to support the formation of collagen in the body. Of the 283 calories in coconut flesh, most come from the 26.8 grams of fat. This can be processed into "coconut oil" or unrefined "virgin coconut oil." Both of which are excellent plant sources of fat, especially for those plant based keto dieters out there! Don't be scared off by the sound of high saturated fat content either! 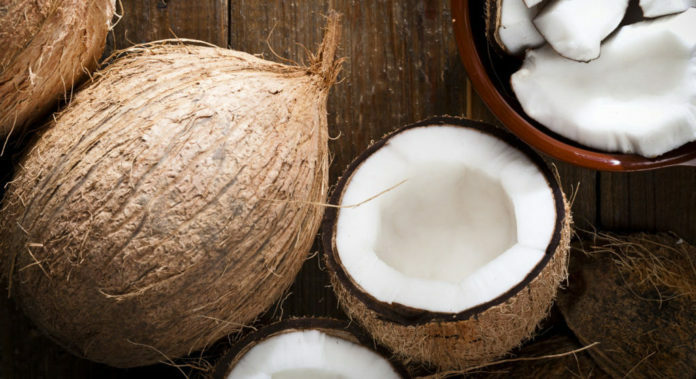 Coconut fat has been shown to increase good cholesterol while possibly being able to lower bad cholesterol. These fatty acids are also medium-chain-triglycerides or MCT's which are broken down fast and used as quick energy! Coconut water is ideally harvested at 5–7 months of age, to contain the most water. This is because as the coconut matures, the liquid is replaced with that coconut flesh. 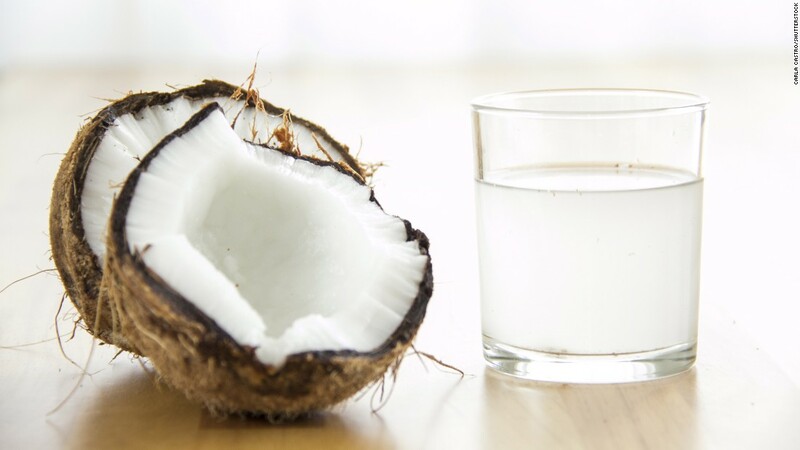 So the greatest nutrient health benefits of coconut water comes from drinking the water of the young coconut, not the mature coconut milk, which is generally lower in nutrients. This liquid contains approximately 46 calories per cup, 10 grams of natural sugar, with little protein and zero fat. It's claim to fame is that it contains multiple vitamins, minerals and phytochemicals that are ideal for human health. The primary nutrient in coconut water ispotassium. It contains approximately 600 milligrams (12% DV), making it a high electrolyte beverage. It also contains a small amount of sodium, about 40 milligrams and up to 10% of your DV of calcium and magnesium. These electrolytes are critical to maintain blood volume, heart health, as well as to prevent dehydration. By maintaining electrolyte levels can help reduce fatigue, stress and help maintain muscle relaxation. So you can see why this clear coconut liquid is popular among athletes! This is one of the reasons why it is used it natural fitness supplements like Organic Muscle’s "Organic Replenisher" or MorelliFit’s “All-Natural BCAA’s!” Use Discount Code: Brando at checkout for 15% OFFOrganic Muscle & MorelliFit Products! Once the coconut matures, the coconut water becomes coconut milk. Because most of the nutrients get deposited as the coconut flesh during this process, a new coconut "nut milk" was created. This "nut milk" is made by blending the coconut water with the coconut flesh, which is then strained, leaving a thicker, richer milk. This milk is higher in saturated fats and calories than its water counterpart. Full-fat coconut milk contains all of its natural fatty acids, while “light” coconut milks are strained to remove some of the fat, which creates a thinner, lower-calorie milk. Because coconut milk is completely free from dairy, lactose, soy, nuts or grains, it’s a good option for anyone allergic to dairy and nut- or grain-based milks, plus it’s vegan and good for plant-based eaters. Even the protective outer shell of this nutritious nut is beneficial! A natural fibre called "coir" can be made from the husk, which is used in products such as floor mats, doormats, brushes and mattresses. Charcoal can also be extracted from the shell by burning them. This activated charcoal is a potent natural treatment used for more than 10,000 years from Chinese Medicine healers to Ayurvedic practitioners to trap toxins and chemicals in the body, allowing them to be flushed out so the body doesn’t reabsorb them. Recent studies have shown that the benefits of this activated coconut charcoal go beyond its ability to absorb toxins. A study in the American Journal of Gastroenterology found that activated charcoal prevents intestinal gas following a typical gas-producing meal. This along with the studies around the world that show activated charcoal reduces bad cholesterol and increases good cholesterol, prove it is a powerful natural medicine. Last but not least, we get to the sweet stuff. Coconut palm sugar that is! This natural sweetener comes from the coconut blossoms of the coconut tree. These blossoms offer a sap that can be processed to create a syrup or honey-like substance, which is then dried to form coconut sugar. Even though it does cost more than regular granulated sugar, the tremendous benefits make it well worth it. Coconut sugar is better for diabetics and the gut than your normal, everyday sugar. It holds trace amounts of vitamins and minerals such as iron, zinc, calcium, potassium, some short-chain fatty acids, polyphenols and antioxidants, and a fiber known as inulin. This fiber may help slow glucose absorption, offering an alternative for those dealing with diabetic concerns. These are all benefits that regular sugar does not bring to the table. This is a tasty, low-glycemic replacement for white and brown sugar. It’s naturally delicious and adds a rich flavor to your baking, dessert and breakfast recipes. Make the switch using a simple, 1:1 ratio. I love this organic coconut sugar from BetterBody Foods! They use only the best quality ingredients to make your foods the best they can be. You can now use Discount Code: Brando at checkout for 10% OFF All BetterBody Foods Products! These amazing benefits and it's ability to sweeten foods lead Organic Muscle to utilizing it as a sweetener in their "Organic Pre-Workout." It gives it just the right amount of sweetness without the worry of a glycemic spike and crash. From this nutritious natural sweetener to the electrolytes in the coconut water, this superhero among superfoods sure has the health and fitness world going co-co-nuts!